Hello friends, for those who are already readers surely have noticed that my site has some slight changes or big changes for me. If you know what I’m talking about, thank you very much, yes you realize that the domain is not the same and there is also a flag of Mexico in the first menu. These changes I’ve made I would like to share and show them how to create an international website on WordPress. For some time, I was thinking of making my website more of an international site. The site itself carlosbarraza.com.mx gave me the name I wanted, but that .mx was limiting me to a geographical orientation. 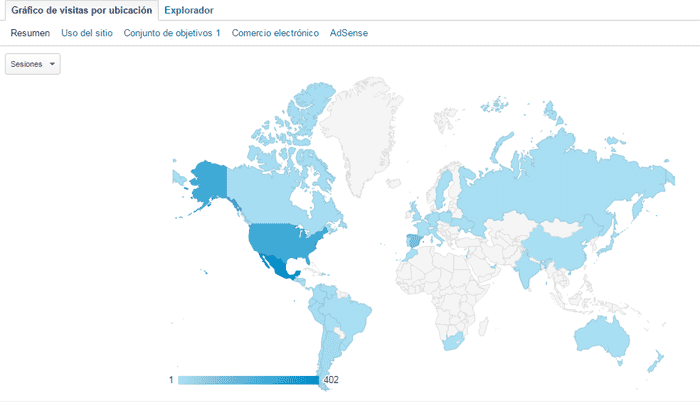 Also by watching in Google Analytics I was beginning to have visitors from other countries. It made me think about the domain and the language I was using. In particular, when I saw a bounce rate over 90% of visits from english speaking countries. One option was to stay with my ccTLD (Country-code top-level domain) that was .com.mx and publish two separate posts, adding one in the category of English. From a search engine optimization perspective, it could be seen as duplicate content if I did not add the HREFLANGS or codes that indicate the language. Something that was not very practical. Also, my Themeforest template is conditioned to install the plugin WPML, which helps to add different languages without any work. But the cost per year is $ 79 or if you want it lifetime is $195. Kind of investment that has to be done. So, out of curiosity I found in the list of WordPress plugins WPGlobus. A plugin that is free and that has been constantly updating, but up to date it works great. What it will take time to complete, is translating the old posts I have. At the moment I decided to keep the site in Spanish and translated only into English, because it takes too long. But surely, in the future maybe you will see my site in Italian, Portuguese, German and why not in Russian and French. I leave here a mix of important points summarized to create a website and also a step by step to how to make an international website on WordPress. As you may already know, having a domain is the key to start creating your castle on the internet. The name will show your idea to the digital world. To buy an internet domain is not difficult. Just go to Google and search for term terms related to Internet domain. Sites like Godaddy, NameCheap or hundreds will offer the service. If you are thinking about how to make an international website, I recommend you go for .com. Although a site aimed at your country, or the name you want is available only with a different ending in .com is on offer, I recommend that you keep thinking about the name but focus on it .com. In my experience with my .com.mx site, as I mentioned, bounce rates were higher in countries other than speaking. They even in a Linkedin group, to share a mine content in English in a group associated with spam me! If it was the first time she shared, most likely it was that to see a .mx them has sounded weird. And to continue with the creation of the website, remember to host the site WordPress is better with hosting. Here are these guidelines to know how to choose the best hosting for your project. The Best WordPress Hosting by Who is Hosting This? 2. Install WordPress on your hosting, and begins to set. An important point of how to make an international website is to use a recognized worldwide for its ease of creating great web application. WordPress is the most used websites make application. No doubt, its interface may seem a little complicated at first, but as time passes you will become familiar with the system. If you’re not a programmer, or flat do not understand much of hostings and domains, maybe I can seem very complicated. However, it is very easy to install WordPress on a hosting. I leave here this video on how to install WordPress on your hosting. 3. Install a free default theme or template and begins to generate content and pages on your site. WordPress interface you can have the design you like. If you do not have money to invest in a good web design, there are free templates that are easy to install. If you want to invest a little more, on site Theme Forest there are endless excellent design templates that you can purchase at an affordable price. Once completed the design you like, it’s time to write, add images and others. Now I will tell you how to make an international website using WPGlobus. Here is a mini tutorial to install the plugin. I hope you have served them these small steps showing how to make an international website on WordPress.